Lagos NURTW chieftain MC Olumo yesterday, Thursday, January 31st spoke about his near death experience during a thanksgiving ceremony at his Ejigbo residence. While thanking all that came to celebrate with him, the light skinned man narrated what actually happened and his huge save. “I want to give thanks to God for saving my life, because only I, knew what hit me at that moment. Immediately it happened, I felt light and I started feeling thirsty, just like someone who had been shot and loosing blood. I knew if I had taken any liquid at that time, I would have died. But what came to my mind was the 7-7 water I got from Mecca. I have seen and experience how Alfas make use of the Holy water and how it works. While I was being rushed to the hospital, all I could do was to request that my people try as much as possible to get me the 7-7 water. I took the water and became a bit alive after some days. Some other Islamic rites was also carried out immediately and the Imams, Pastors, and Traditionalists rose up to the occasion. It was the third day, that I regain consciousness and felt life within me.”, he narrated. 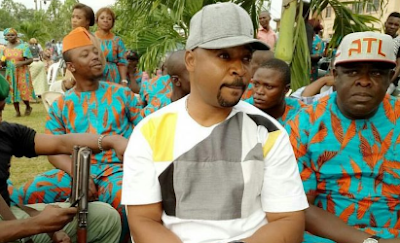 Oluomo took time to thank all his family members, religious leaders, music and movie artistes and Asiwaju Bola Ahmed Tinubu particularly for all the supports, prayers and love. He called for calmness in the state and advised the people to look only unto God for all things. The event was attended by personalities from all walks of life. Some of the guests include Imam Muyideen Bello, Wasiu Alabi Pasuma, Ronke Oshodi Oke, Nike Pella, Fausat Balogun, Saoti Arewa, Oyiboyi and many more..